UNITED NATIONS, Apr 4 2014 (IPS) - Although world peace has been a societal goal for centuries it cannot be achieved without sustainable development and vice-versa, a high-ranking U.N. official said Wednesday. “The fight to build tolerance, protect diversity and promote co-existence is a moral obligation if we want to advance the cause of peace, human rights and development,” said U.N. High Representative for the Alliance of Civilisations (UNAOC), Nassir Abdulaziz Al-Nasser. Al-Nasser added that the U.N. has prioritised the issue of peace and has implemented its vision worldwide through various U.N. bodies. Since the U.N.’s 1999 declaration on a Culture of Peace and the establishment of the UNAOC in 2005, participation in the alliance and initiatives towards a peaceful society have widened and deepened, said Ahmet Davutoglu, the Turkish minister of foreign affairs. “Without peace, stability, the rule of law and good governance we cannot ensure the wellbeing of our people. Violence in all forms, lack of the rule of law and weak public institutions have hampered the progress in achieving the Millennium Development Goals (MDGs) in many parts of the world,” he said. Speaking about the MDGs, Amina J. Mohammed, the Secretary-General’s special advisor on post-2015 development planning, said countries that are off track in attaining the MDGs are often the ones that suffer from violence and fragility. 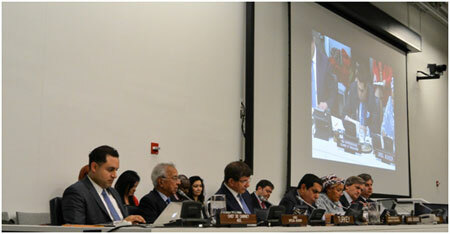 The panel agreed that to achieve sustainable development, a peaceful co-existence is necessary. “Many of the present conflicts have clear cultural dimensions based on social and ethnic differences. It is not possible to build lasting peace and security without a sustainable and equitable development,” said Ambassador Román Oyarzun Marchesi, the permanent representative of Spain to the U.N. The Permanent Representative of Qatar to the U.N. Ambassador Sheikha Alya Ahmed Saif Al-Thani stated that sustainable development could not be attained during tension, war, terrorism, turmoil and violence. Al-Thani stressed that the UNAOC has an imperative role to promote dialogue tolerance and understanding amongst civilisations, cultures and religions. “These challenges require urgent and collective action to achieve mutual respect and to provide equitable development chances for each individual and community,” she said. Yusra Khan, the deputy permanent representative of Indonesia to the U.N., alluded to Indonesia’s experience with managing over hundreds of cultures in its own country along with their participation in the Association of Southeast Asian Nations (ASEAN). “Indonesia has 240 million people that come from hundreds of cultures and have hundreds of languages and local dialects. For centuries, people in the vast archipelago has learnt the advantage of learning about different cultures,” he said. “Peace, security, human rights and development are mutually reinforcing elements. Without peace there will be no chance for development,” he said. The UNAOC was established by former Secretary-General Kofi Annan to understand the divide between cultures and society and to form programmes to address the issue. The meeting was held in preparation for the upcoming UNAOC annual focal point meeting in Doha, Qatar from April 29 to 30, and its sixth global forum in Bali, Indonesia from August 29 to 30.